I can not really pinpoint where the idea for these Smoked Salmon Sandwiches came from. I can tell you exactly where the name came from however. We had Tom and Libby staying with us for a few days and I decided that I would like to make everyone lunch in lieu of going out. Libby is a strict vegetarian but lately she has been trying to eat eggs and fish in preparation of a huge climb she and her climbing partner are training for. I decided why not make a really fancy sandwich with smoked salmon to try and ease her into the texture and taste of fish. Libby did not want to take a bite. She tore off the smoked salmon and ate what was left. Tom and I made a second sandwich with Libby's removed salmon and chomped it down. While we were eating that second sandwich Tom said, "How can you not like smoked salmon, it is the bacon of the sea!?!" I thought to myself, "It really is and that is what I am naming this sandwich!" Enjoy! Mix together all ingredients in a medium mixing bowl until even (making sure to mush avocado into spread,) sit to side until ready to use. Mix together all ingredients in a small dish until even, sit aside until ready to use. Slice bagels to make sandwich buns. Spread 1/4 of bottom spread over both bottom slices of bagels and then rub the top and bottom bagel slices together (this will leave a little of the bottom spread residue on the top bagel bun.) Place bagels slices into toaster oven and toast for 2-3 minutes. Place pieces of smoked salmon onto each bottom bun and spread your desired about of top spread over the fish. 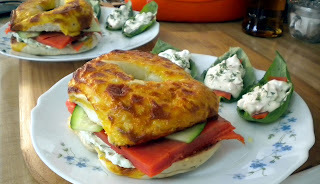 Place 3 English cucumber slices onto each sandwich (optionally add tomato slices) and top with bagel bun. Enjoy!